/ Nadi leaves- their significance ! Nadi leaves- their significance ! Our bramh-rishis, viz. saints who had attained Bramh or Supreme God, were trikal-drashi. They could ‘see’ all three kals – past, present and future without error and with utmost convenience. They could see karmas or deeds of all humans, animals, and even of rishis at just mere thought. Those great sages like Magadh, Kaushik and Bhrigu decided to write lives of humans on barks of trees. It was a momentous and stupendous task that was completed by grace of God alone! Nobody exactly knows how much time it took them to compose these leaves and that too in wonderful poetic manner. 1. To let a native know his past and present – till the time he or she approaches a nadi reader and gets his leaf traced and read. Some key and salient events confirm that the nadi leaf pertains to that soul. Event can be something like: ‘you have a pending court case against brothers on property matter, your mother’s name is 3 worded and has name of a city embedded and your job is consultancy related to technology’. Once a nadi leaf is confirmed, remaining two aims are justified. 2. Parihar or remedies to maximally offset evil effects are offered. These include wearing a particular item, performing specific poojas and going for particular temple-darshan on specific occasions. For example, someone may be advised to wear a bracelet of a rudraksha and an amulet (yantra), go for Ganesh Chaturtithi celebrations at a specific temple in Maharashtra and getting Maha Saraswati pooja done for 21 days with donation of 8 ayurvedic oils and flowers. Aim was to get Nadi Leaf identified and get Parihar done. 3. Learn some future events. I use the word ‘some’ because all events cannot or should not be revealed ruthlessly. For example if a person has to undergo a major painful surgery after 10 years, it is better to hint at bad health and get Parihar done rather than make him live a fearful life at all times for next 10 years. 4. The last & fourth aim of Nadi reading can be getting detailed ‘Kandams’ or chapters opened. Each chapter corresponds to a set of topics or areas of life. For example, most popular chapter 5th one relates to progeny, reasons for denial or delay of progeny and getting remedies to offset it. a.	Vansh proceeds: commonly means that a male child will forward the lineage of family. b. Parallel friendship: Can mean an extra-marital affair or a romantic relationship. c.	Government related problem: Can refer to Tax, Judiciary or other punishment by a state body. d.	Decent life: Prosperity, wealth. 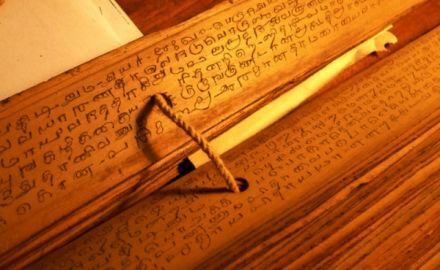 As we can see, all these are translations from old Tamil / Sanskrit to English. It is amazing heritage of India that these leaves are preserved and used even till date. As with everything, fake nadi centers have cropped up everywhere that somehow convince customers of possessing their leaves and move ahead by fleecing money.